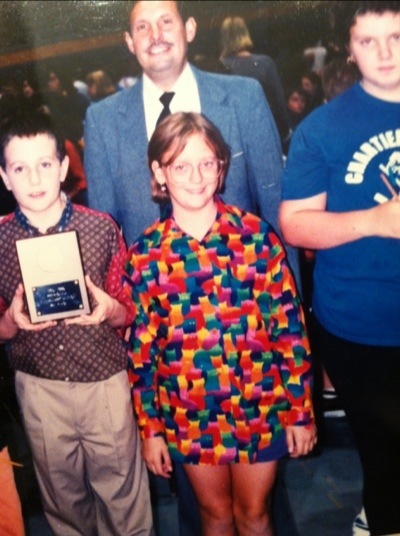 I could care less that we won second place that year; I was wearing my favorite shirt ever, handmade by my mom in rainbow cat fabric that I picked out myself. You can’t see them here, but she even made matching cat-shaped buttons out of Sculpey. My mom is crafty and she is dedicated. Thanks, Mom, for indulging my personal sense of style (and sense of humor). Thanks for always hand-making our Halloween costumes, whether I wanted to be Cleopatra or Cousin It. Thanks for trusting me enough to use your Prismacolor pencils, and I am truly sorry that I was always using your fabric scissors to cut up magazines and make collages. Once I outgrew this shirt (and wearing stretch shorts to school), thanks for being OK with my skater shoes and wide-leg jeans. I still remember the two pairs of Doc Martens you found at a discount store in my size and surprised me with: mint green patent leather, and white netting with silver glitter. I don’t know what my friends were more jealous of: my boots, or my awesome mom. You should know that I have my own fancy fabric scissors now, which I keep in their own special case and never use to cut anything else. You’re the best mom a creative lady could ask for.